Here is the proposed itinerary for the Camino Portuguese Tour I’ll be leading in April 2014. The itinerary will also have us arriving in Santiago in time for the Easter Sunday Mass in the Cathedral – and all the Easter celebrations in Santiago. Again, it should be amazing. If you want to know more, there’s information on the forum – If you wish to come along, please visit the forum and put your name down. There’s a discount for PGS folk. It is going to be the trip of a lifetime. From what I have researched so far, it seems the Camino Portuguese is relatively flat – nothing as strenuous as the Camino Frances. 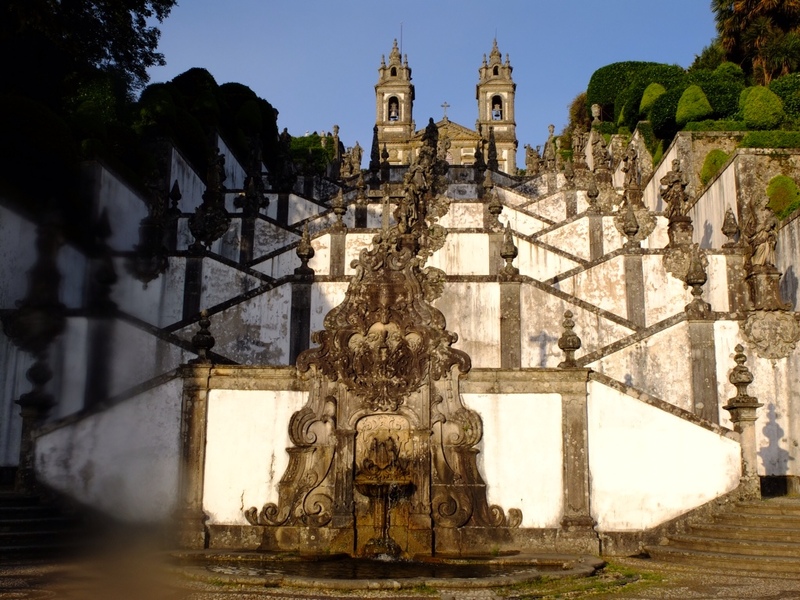 yes, Jennifer and I went by train down to Porto, then took the train back stop by stop – spent nearly three weeks – in the little towns and villages along the way. And the food is magnificent. I took it upon myself to try and find the best Portuguese Chicken – grilled and flattened out. Barcelos is famous for its chickens, like Bresse in France, and I found a restaurant there which was incredible. best chicken I’ve ever had in my life, and cheap – an entire chicken for �8. And then there’s the Portuguese tarts� yummy!! Several years before I retired from my railroad career, I worked in the Portuguese section of Newark, NJ (called Down Neck). Every day I ate Portuguese food, positively delicious. I can see this, just like the Frances, will be a treat for all us foodies. The little towns along the way also hold much history. It is said Queen Isabella walked this very route to Santiago de Compostela. Stopped off for a cervesa in Lorca. I could eat 5 of those chickens right now! I’m considering your trip… But can’t commit as yet. I guess you’re off again this morning, yes? Bill, I’m in Estella, waiting for Asador La Tasca to open… 9:00 pm… It’s across the street from the old bull ring. Long day, very hot… But awfully pretty! I may stay an extra day… I like this city! Estella is a beautiful town. Yeah, Easter mass in Santiago de Compostela! Pretty close to perfect, Bill – and Easter at the Cathedral! Will there be room for us? Well…..
the seas will part for you! I won’t be able to come on the tour. The timing is not good for me. I am a cat sitter and Easter weekend is one of my busiest times of the year. But I will be glued to your Blog 🙂 And maybe later in the year I will walk. Very tempting, alas too soon in the year. BUT, the nice thing will be, I can follow you via blog and then follow in your footsteps later in the season… I know I will pick up all of your energies… . Bill, as soon as Jose is back from his duties in SJPDP, I will write to him to connect with you. home for overnight only, an off to my mother in laws again. Packing, sorting, for her move into assisted living by Sept. 15. Very stressful and sad at times… she has to let go of so many things. I am keeping a journal, for my own sanity and an outlet to remind me, that this too is part of life. I did all this with my mother’s things, after she and then a few months later her companion passed and I closed out my home in Austria… I promised myself then, I would start organizing my own home in Canada… (not). I so planned on doing that once I was back from the Camino… my house felt overwhelming with all those “things” we accumulate over a lifetime… (have been doing this in baby steps). And now this – full on, 87 years of living- compressed to a 1 bedroom apartment. How to you fit the Louvre into a postage stamp?? And since I promised her that we would not discard of things until she passes – my home will be overflowing once more. All I know for sure is that… as on the Camino… each day unfolded as it was mend to be… this Camino of mine helping my mother in law transition into her new reality… holds daily surprises. This sounds like a really good tour – well planned, hits highlights, easy and challenging at the same time. Congratulations (and I just saw your comment on my most recent post – YOU have a way with words, my friend. I’m touched).